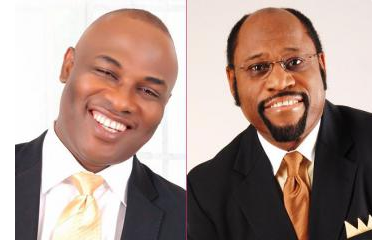 A man Bolaji F. Richard has claimed that the deceased prominent preacher, Myles Munroe is in heaven. Dr. Munroe was killed on Sunday in a small plane crash along with wife, Ruth Ann in the Grand Bahama, Bahamas.Mr Richard said he had a vision from God, who showed him the aftermath of the crash which killed everyone on board.Narrating his vision titled ‘Brother Myles Munroe is with the Master’ via Facebook, Mr. Bolaji claimed he saw angels taking up the deceased preacher to heaven. When the news of his demise was broken to me early yesterday morning by a friend I was sad for a greater part of the day and few minutes to nine o’clock last night in republic of lome Togo ,while in the midst of a service in which bishop ISAAC NWAOJI was ministering with a very heavy anointing the lord took me by his spirit and began to show me what transpired few seconds before disaster and what took place afterward .I was still conscious of the environment I was physically , I was not completely taken out of into a trance , but I could clearly see from a AFRICA an event that took place several hundreds of thousands of kilometers away a day before ! Beloved this is The vision of brother Myles Munroes I saw the mood he was few seconds before crash and after the impacts.Shortly before the crash few seconds to disaster ,He was sitting in the plane chatting and laughing with his wife and daughter , all belt up and he was looking out on the window side at the landscape that has appeared close to landing , he took one final glance very quickly over his notepad about what he was going to say where he was heading to . The spirit of God made me see a notepad like a tablet This note I saw containing some instruction and admonition arraigned in power point format meant to challenge boldly people what will they be remembered for After they had gone out of this world ?what he was going to say among other things to the scheduled audience was to challenge them about how to leave good legacy on earth behind them when they die! I saw a part of his preaching note!When the crash occurred ,less than a split or fraction of a second ,in the midst of the wrecked plane, he took off mortality for immortality he was changed almost instantly ! the way he took of mortality was like someone who returned from an outing and remove his shirt ! . that was the way the earthly body was done away with an incredible ease ! So easy ! What he took off was like a roughened body mask from head to toe and this revealed a shining radiating spotless being with not one single crash impact !the light radiating on it was glowing like a million fluorescent ! on this spirit man was a robe it was as if he already wore it underneath his dress ! Angels bore him up and he shot into the sky with an incredible speed with children and wife like a rocket shooting into the cloud going upward with a lighting speed from earth to the heavens , it was a lighting quick speed ! He went up into the cloud and disappeared beyond the cloud full of smiles and glowing radiance on his face ! With trails of angels !Ushering him into presence of JESUS ! While dr mule was there in a humble reverence, thousands of Angels are still at the crash site ! I could not count the Angels I saw ! They were more than the rubbles, they were more than the people there ! Why they stayed back around the crash site I do not know !,they didn’t follow the Angels that took him up !The Heavenly reception he was given cannot be compared to the one waiting for him where he was heading on earth before the crash ! it cannot be compared to what the president of the earth ever gave him in any nation or any one at any airport on arrival ! The best honour he had on earth looked like trash or even a parade disgrace compared to this golden and incredible reception! I saw Angels singing at his arrival like a recessional song it was as if they knew he was coming and had been rehearsing the songs since ! Oh I mine! Oh mine! Oh mine! This I cannot described! This I cannot described! I have no words ! What a reception! What a glory! What an honour ! I saw in between the crash site and the heaven was like something like a ladder ,some sort of connecting link or map link between the earth and heaven together! On this note I am no longer sad ! Let us bury the rough mask he shed . Let us go and bury his earthly suit ! The real Myles munroe is before his master in an humble adoration! This thing is real ! Real HONOUR await true servant of God in heaven! Please judge with bible and retweet but please do not take away or add to it . Pope Benedict XVI did something rather striking, but which went largely unnoticed.